Breaking news!!! Even though it has been revealed that BT series gets Christmas mugs, Starbucks decided to come up with the fourth Christmas edition for You Are Here series. This time mugs are going to look really special, see the picture of this You Are Here Christmas France mug. I believe this is due to red handle and I really think it was the right move from Starbucks. Do you guys agree? The word on the street is that there will be more countries getting Christmas mugs. Can’t wait to add those to the site! For the European YAH mugs this would be the third version rather than fourth. Interesting to note that for versions one and two the Christmas editions were for the capital city (i.e. Paris / London / Berlin) whereas this release is for the country. Now they’ve moved to a country version, for the UK I wonder whether it will only be an England version or whether there will also be a Scotland and Wales? I believe they will only release England, but you never know. Ooh these are nice, I hope we get one in Norway! I really hope for Norway Ornament. 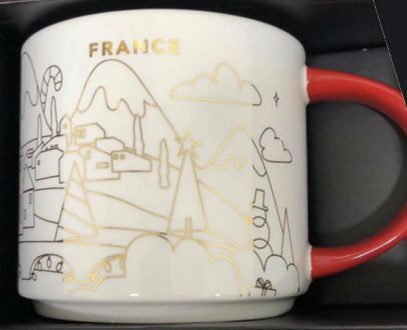 I saw the France YAH Christmas mug yesterday…it is eye-catching!